Hear ye, hear ye fans of Monty Python: the Spamalot slot machine from Playtech is sure to capture your attention in the true-to-life slapstick comedy style. This is a five-reel, 20-line progressive jackpot game that is sure to make you giggle! As the intro screen says, this is no ordinary jackpot game! You'll see a velvet curtain opening to a countryside background and a cow stands just to the left of the reels. On them, you'll see King Arthur, Sir Robin, Sir Galahad, the Lady of the Lake, and, of course, the Holy Grail depicted as a chalice. Even though it was obviously created for low rollers with a betting range starting at a penny and climbing to $50, the top in-game prize is $7500 and there is a second progressive jackpot that is usually worth tens of thousands. Placing a bet is simple using the features at the bottom of the screen, and you can even set the Autoplay function so you can sit back, laugh, and relax. The wilds are labeled and they can substitute for any regular icon to help produce prizes. When two or more appear on an active payline, they have their own individual payouts. There are two uses for the labeled scatter, as well. First of all, it pays when two or more appear on a payline. 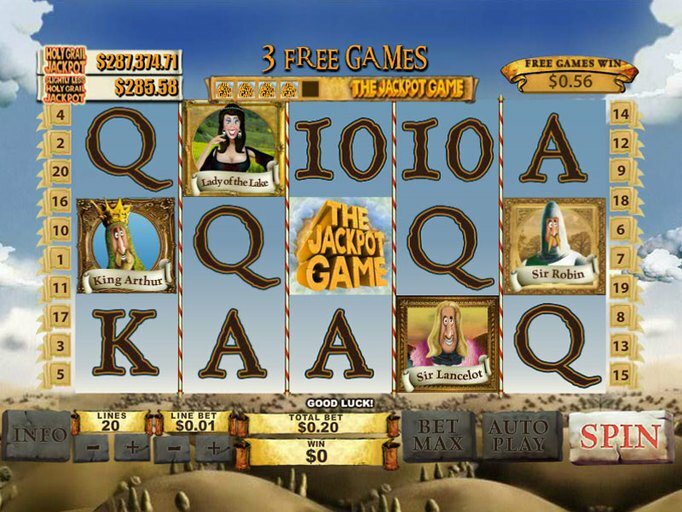 Second, when there are three or more on the screen, you'll get 10 free spins with random wilds. The Holy Grail jackpot round can only be triggered during the free spins and this will take you to a huge hill that has six levels. You'll need to pick from among some animals to win instant prizes. As long as there is a cash amount, you'll keep climbing until you reach the top where you'll win either the Holy Grail Jackpot or the Slightly Less Holy Grail Jackpot! Of course, if you pick an animal with no cash value, the feature stops immediately. When the bonus icons appear on reels one and five simultaneously, you'll be able to participate in one of four second screen rounds: Storm the Castle, None Shall Pass, Knights Who Say Ni, and Killer Rabbit. Each one has its own inherent set of rules and is just as silly and fun as the next. For instance, in the Knights Who Say Ni, you'll need to find and locate a shrubbery with a cash value! It all follows the storyline, so Monty Python lovers and fanatics will never be disappointed. Now that you're all fired up dodging the cows flying at the knights from the top of the castle, make ye way over to Sports Interaction Casino where you'll get some Spamalot free spins to get you started. You'll never be obligated to make a deposit of any kind, but if you choose to do so, they'll give you a 100% match up to $100.